The Washington Bridge consists of two 510 ft long steel arch spans supported on stone masonry piers and with stone masonry arch approaches. This was the first long span arch bridge to use plate girders for the arch ribs. The bridge is situated between high bluffs in Manhattan and the Bronx with the deck 152 ft above the Harlem River, making it one of the tallest bridges in New York. 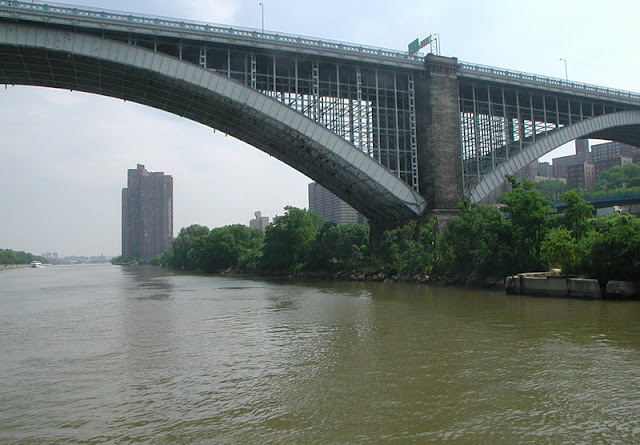 One of the arches spans over the river and the other spans over railroad tracks and the Major Deegan Expressway. The bridge was built in 1888 from a proposed design by C. C. Schneider that was pared down to bring the cost to $3 million. It was considered a rival in beauty to the Brooklyn Bridge when it was completed. Although the bridge was built quickly (in two years), at cost, and with considerably less financial scandal than other New York City bridge projects, a controversy concerning bridge commissioners' salaries delayed the opening by several months. Today, the Alexander Hamilton Bridge carries most of the traffic formerly carried by the Washington Bridge. New York City's Bridges: Washington Bridge by Mark Yashinsky is licensed under a Creative Commons Attribution-NonCommercial-ShareAlike 3.0 United States License.